Operators: Grezin V., Maksimov L., Semin V., Fedyaev E.
About the friendly visit of the General Secretary of the Central Committee of the Socialist Party of Yemen, negotiations. 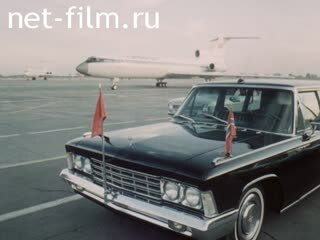 1 hour - Visit of the delegation of Yemen (Southern Yemen), headed by A. F Ismail, in the USSR. Meeting of the delegation in Tashkent airport. Admission to the Communist Party of Uzbekistan. Ramidov. Visit to Moscow. Talks with Leonid Brezhnev. Rewarding Abdel Fattah Ismail Order. The laying of wreaths of the Yemeni delegation to the Mausoleum, the tomb of the Unknown Soldier. 2 pm - Visit to Moscow State University, meeting with students. Soviet-Yemeni treaty. Visit to Leningrad. Reception at the GV Romanov. The laying of a wreath at the monument in Victory Square. Flags of the Soviet Union and the People's Democratic Republic of Yemen. At the airport, the Secretary-General of the Yemeni Socialist Party, Chairman of the Presidium of the Supreme People's Council of the People's Democratic Republic of Yemen t.
Abdel Fattah Ismail met - a candidate member of the Politburo, the first secretary of the Communist Party of Uzbekistan t.
Sh.R. Rashidov, Chairman of the Presidium of the Supreme Soviet of Uzbekistan t.
Usmanhodzhaev, Secretary of the Presidium of the Supreme Soviet of the USSR, ie., MP Giorgadze and others. Guests are presented with flowers, greeting guests gathered at the airport. On motion withdrawn streets of Tashkent. In an interview attended by the leaders of the Communist Party of Uzbekistan, the Presidium of the Supreme Soviet of the Uzbek SSR and the Council of Ministers of the Republic. Abdul Fattah Ismail and his entourage. Guests from Yemen visiting the monument "Courage", reminiscent of the earthquake April 26, 1966, and the courage of the people to revive Tashkent. Served on the street flowers. Laying a wreath at the Tomb of the victims of the Great Patriotic War. At the airport, the delegation met with Democratic Yemen: General Secretary of the CPSU, Chairman of the Presidium of the Supreme Soviet of the USSR LI Brezhnev, member Politburo, Minister of Foreign Affairs of the USSR AA Gromyko, Politburo member, Soviet Defense Minister, Marshal of the Soviet Union tons. DF Ustinov, a candidate member of the Politburo, Secretary of the CPSU t.
Honor guard, musicians play the anthem, meet, welcomes people. t.
LI Brezhnev and Abdul Fattah Ismail. The Kremlin held talks LI Abdel Fattah Brezhnev Ismail. Negotiations are conducted by government officials of both countries. Sit at the negotiating table LI Brezhnev, AA Gromyko, DF Ustinov and others. The Kremlin Abdel Fattah Ismail t.
LI Brezhnev gives the Order of Friendship of Peoples. Present VV Kuznetsov, BN Ponomarev, AA Gromyko, DF Ustinov and others. The Democratic Yemen lays a wreath at the Mausoleum of VI Lenin. The building of Moscow State University. Abdel Fattah Ismail meeting with the faculty of the Moscow State University, in the hall Abdul Fattah Ismail, an honorary doctorate from Moscow State University, speaks to students. The Kremlin is the ceremony of signing of the Soviet-South Yemeni documents. Documents for the Soviet Union signed LI Brezhnev, for the People's Democratic Republic of Yemen - General Secretary of the Yemeni Socialist Party, Chairman of the Presidium of the Supreme Soviet of Southern Yemen t.
On the Soviet side at the signing were: DF Ustinov, AA Gromyko, Y. Andropov, MP Giorgadze, VN Ponomarev et al. Farewell ceremony guests from Moscow to Leningrad. Brezhnev and AF Ismail bypass troops. The delegation was escorted tons. LI Brezhnev, AA Gromyko, DF Ustinov, BN Ponomarev. The head of the Yemeni delegation - on the plane. Meeting at the airport AF Ismail comrade. Accompanied on the trip to Leningrad, head of the delegation, Deputy Chairman of the Presidium of the Supreme Soviet of the USSR so. Leningrad - government vehicles travel through the streets. Receiving a member of the Politburo, the first secretary of the Leningrad party t.
Guests from Yemen visit Smolny It examines the Victory Square monument to the heroism of the defenders of Leningrad during World War II. Head of the delegation lays flowers. A fragment from the ballet composer Andrei Petrov "The Creation" in the Academic Theatre of Opera and Ballet. At the airport before flying home Abdel Fattah Ismail gives interviews.